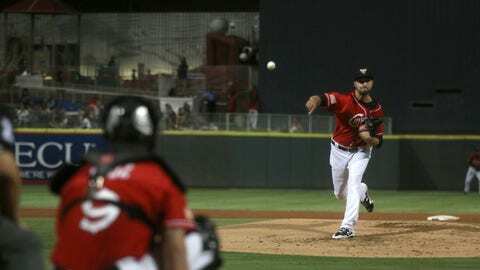 The El Paso Chihuahuas had a successful 2017, winning their third straight division title. The club had a much different composition this season, relying on veterans as opposed to last year’s prospect-laden club. While the 2016 squad won the PCL championship for the first time in franchise history, the 2017 squad fell one game short of another championship, losing to the Memphis Redbirds (Cardinals organization) in five games. Once again, El Paso had one of the top offenses in the circuit, paced by outfielder Franchy Cordero and a slew of minor league free agents like Nick Buss and Christian Villanueva. While the pitching staff has held together with duct tape, organizational veterans Adam Cimber and Bryan Rodriguez. Top Players: Franchy Cordero was the offensive star for El Paso in 2017, as evidenced by his absurd .326/.369/.603 batting line. His .972 OPS was good for third in the league and he paced the league in triples with 18. He hit 17 homers for good measure as well. If there is a flaw in Franchy’s game, it’s plate discipline. He struck in over 28% of his plate appearances in the Sun City — a number that ballooned to 44% in his brief stint with the big league club. Cordero’s talent could make him a star if he can make the proper adjustments. Chihuahuas OF Franchy Cordero watches the ball after contact. Photo credit: Ivan Pierre Aguirre. Former Angel Nick Buss signed a minor league contract last winter and didn’t make the El Paso roster out of spring training. After the organization sold infielder Jamie Romak’s contract to a Korean League team, Buss came up to stay — and he ultimately won a batting title. Buss, 30, hit .341/.395/.541 with eleven homers. He saw time in the outfield and first base but did not get a big league call-up in September. He can be a free agent and his solid year should earn him a gig somewhere in 2018. Others of note: Former Cubs prospect Christian Villanueva parlayed a successful season into a first trip to the big leagues. He hit 20 homers for the Chihuahuas and showed outstanding plate discipline. … Outfielder Jabari Blash only played in 72 games for El Paso but he tied for the team league in homers. His power is off-the-charts but he is probably a quad-A masher until he can make more consistent contact. … Outfielder Rafael Ortega was a nice find for the organization, as the former Angel and Rockie farmhand hit .317 and stole 26 bases. Like Buss, he can be a free agent but his speed and ability to make contact could make him a candidate to return to the organization next season. On the mound: After the promotion of Dinelson Lamet, there wasn’t much in the way of prospects left in El Paso. The staff featured former big leaguers, minor league free agents and a few long-time organizational stalwarts. RHP Bryan Rodriguez led the team in innings, throwing 126.2 for the Chihuahuas. He gave up 157 hits and only struck out 63 but Rodriguez had a 3.95 in the second half. He has been in the organization since 2012 and has pitched at least 130 innings in every season since 2014. RHP Matt Magill had a 3.95 ERA, despite allowing 146 baserunners in 95.2 innings. He found ways to weather the damage in a rotation that featured several ERA’s approaching seven. He and Rodriguez can both become free agents this off-season. Others of note: Sidewinder RHP Adam Cimber had a 2.92 ERA, filling a variety of roles, which included two starts. The 26-year-old walked just eight batters in 64.2 innings. … RHP Christian Betancourt’s transition to pitcher did not go well in El Paso, as the catcher-turned-pitcher had a WHIP of nearly two and an 8.21 ERA with 33 walks in 41.2 innings. … RHP Chris Huffman started the year in Lake Elsinore’s bullpen and finished the year in the El Paso rotation. The former James Madison hurler touches the low-90’s with his heater and doesn’t have a plus pitch, yet he continues to get people out and his stint in El Paso was no exception. 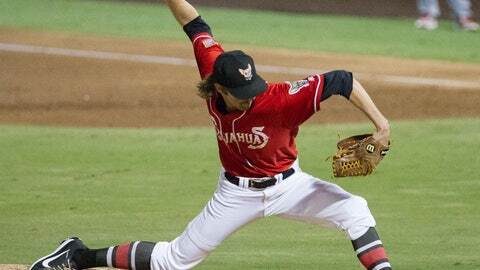 The righty had a 3.31 ERA in seven starts and was the most consistent starter the Chihuahuas had in August/September. RHP Walker Lockett. Photo credit: Ivan Pierre Aguirre. We also spoke with Felix Chavez of the El Paso Times and with Sam Geaney, the Padres Director of Player Development, on the prospects that were in the Sun City in 2017. El Paso broadcaster Tim Hagerty finished up his fourth year in El Paso, the last three of which ended in playoff berths. The talented play-by-play guy has broadcasted in Portland, Oregon, Tucson, Idaho Falls and Mobile, Alabama — all with the San Diego organization. Hagerty also called the Triple-A National Championship game last season, which was heard nationwide. No one saw more Chihuahuas baseball than Hagerty this year and he gave us his insight to another winning season in El Paso. MadFriars: El Paso has won three straight division crowns. From what you have seen/heard, do you feel like more Chihuahuas fans are following the big league club? Tim Hagerty: There have been multiple Padres games where every player 1 through 9 was a former Chihuahua and El Paso has noticed. It’s been fun to see so many recent Chihuahuas thriving in San Diego. 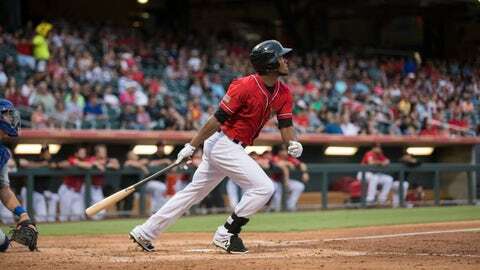 Franchy Cordero was probably the best prospect that played for the Chihuahuas this season. From what you have seen, do you think he is a guy that can become a useful big leaguer? Tim Hagerty: Yes, his development was noticeable from 2016 to 2017. He looked faster and stronger this year compared to a brief Triple-A stint in 2016. Franchy led all of professional baseball in triples, if you combine his San Diego and El Paso total. He was fun to watch. We also recently discovered he tied a Pacific Coast League record. He was the third qualifying batter in league history to ground into only one double play all year. Impressive considering the PCL dates back to 1903. Nick Buss won the batting title this season. What made him so effective at the plate? Tim Hagerty: Manager Rod Barajas said Buss is laser-focused and never gives away at-bats. Back in April, Buss bounced between El Paso and extended spring training because there were too many outfielders and someone had to go. He ended up gaining more playing time and finished with the best average in all of Triple-A baseball. An amazing, unexpected story. 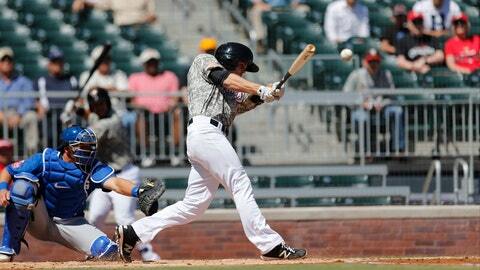 Chihuahuas OF Nick Buss follows through on a swing in El Paso. Photo credit: Ivan Pierre Aguirre. Rafael Ortega was an interesting leadoff hitter with big league experience. What type of skill-set did he bring to the park each day? Tim Hagerty: He’s a steady, excellent player. Ortega quietly tied for the league lead in stolen bases, and would have led the league outright if it wasn’t for a late-season injury. I wouldn’t be surprised to see him in the major leagues again, somewhere. Christian Villanueva had a very good season in El Paso. What made him so good and was it a surprise to see him have a little success in San Diego? Tim Hagerty: It wasn’t a complete surprise to see his home run spree in September because we saw similar stretches in Triple-A. Villanueva homered six times in a five-game span in late June. Rocky Gale has always been a personal favorite of mine. How important was he to the success of the club? Tim Hagerty: Very important. He’s appreciated by the coaching staff and pitching staff. My understanding is the Padres keep bringing him back because of how smart he is. He also led the league in caught stealing percentage for the second time in three years. I was thrilled to see Rocky back in the big leagues in September. RHP Chris Huffman pitched very well in his second stint with the club after one rough outing? Did he seem fazed by jumping up to AAA? Tim Hagerty: He rebounded very well. Huffman was shipped over from Lake Elsinore for a Triple-A spot start in May and didn’t get an out. He reappeared months later and became one of the best pitchers on the team. He was selected to start Game 1 of the PCL Championship series in Memphis. I wouldn’t be surprised to see him become a Kyle Lloyd-like call up someday, someone who put himself on San Diego’s radar through strong minor league outings. Adam Cimber had a very good year out the pen. What type of value did he bring to the club? Tim Hagerty: Cimber was excellent. His unusual sidearm delivery is deceptive to batters. He held hitters to a .216 average and had seven times as many strikeouts as walks. Padres fans should track Cimber, might see him at Petco Park someday. RHP Adam Cimber prepares to deliver a pitch. Photo credit: Grant Wickes. Were there any other players not mentioned that stood out to you? Tim Hagerty: I think Bryan Rodriguez was one of the most consistent pitchers in the organization and could be a candidate to make a spot start if needed. You can follow all of the action in the Padres’ minor league system at www.madfriars.com and @madfriars on Twitter.